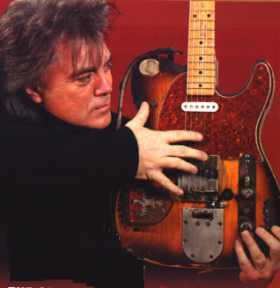 Marty Stuart's well-known Bender guitar started life as a 1954 Fender Telecaster or Esquire and was the main electric axe of legendary country-rock pioneer Clarence White (The Kentucky Colonels, The Byrds). White and multi-instrumentalist Gene Parsons fashioned a steel guitar-inspired mechanism that raised the B string a whole step when downward pressure was applied on the strap, tweaking and modifying their invention until it was stable and consistent. A G string pull was added a short time later. White used the guitar almost exclusively until his untimely end in 1973; it's heard on many of his recordings with the Byrds, Muleskinner, and others. With White's death, the "Clarence White Tele" sat unused at his home in Kentucky until his widow, Suzy, contacted Marty Stuart. "The guitar really found me," recalls Stuart. "Roland White, Clarence's brother, got me my gig with Lester Flatt and I was friends with the family. 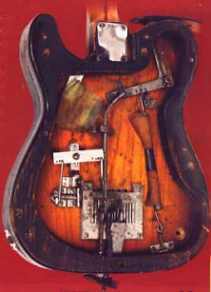 The guitar already had a following of its own by that time -- I was always fascinated by it, lusted after it, and I'd even had a similar bender put in another guitar to try and duplicate the effect. I bought it from Suzy along with some clothes and some other things of Clarence's. "I've never considered it my guitar, really. It's his, and now it kind of has a life of its own. The spring gets dry and squeaks, so I spray WD-40 on it now and then, but I've never cleaned it. All the dirt inside and behind the strings is the original dirt. We call it 'Clarence'." The prototype of the Parsons/White StringBender, the unit in Stuart's guitar, is far heavier and complex than current production pieces. White and Parsons installed a favorite Strat-style pickup in the front position, and West Coast steel legend Red Rhodes re-wound the original Tele/Esquire pickup. A wooden "rim" was added to the back of the guitar to accommodate the protruding parts, effectively doubling the body thickness (the current P/W is more compact and is covered by a large metal plate on the guitar back). The "fingers" which pull the strings, Stuart says, are taken from an old Fender steel guitar. "I don't know if Gene did it intentionally, but the pull on this one is longer, not as snappy as the new ones, and I think that's part of the magic. If you listen to 'It's All Over Baby Blue' (Ballad of Easy Rider), that really shows you the effect. It really has a unique sound -- the lows and mids really speak, and the highs have a roundness that I just don't hear out of any other Tele. I moved one of the Scruggs banjo tuners, from the fifth string where Clarence had it, to the sixth string and the only other thing I've changed is (steel guitarist) Ralph Mooney and I put this pedal on it that lowers the first string a half step (the 'plunger' between the bridge and control plate on the guitar's top)." According to Stuart, the guitar's provenance includes a bit of historic hippidom. "The first time I opened the back, I found this little white piece of paper folded up in there with a chunk of something inside it. We had it analyzed at a lab -- it was acid."